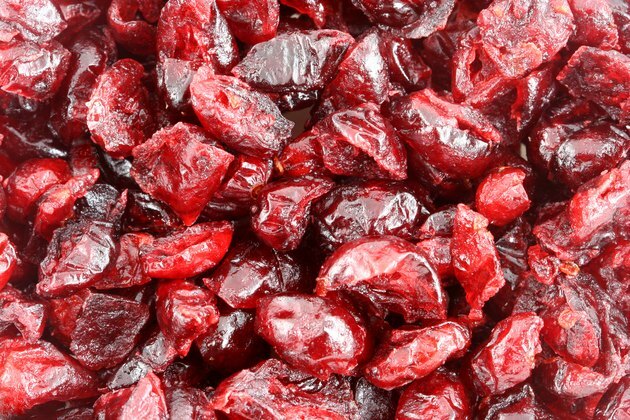 Craisins are sweetened dried cranberries that are tasty alone, but you can also jazz up a variety of foods and recipes with the tiny dried fruits. Their sugar content is the main drawback, though. In addition, craisins don't supply large doses of any vitamins and minerals. They are a fairly decent source of fiber, however, so don't automatically count them out. A 1/4 cup of original Craisins contains 130 calories and no fat. That's a pretty high number of calories for such a small amount of food, and too many calories can hinder weight loss or lead to weight gain. The flavored Craisins -- blueberry, cherry and pomegranate -- also have 130 calories and no fat in each 1/4-cup serving. As for the the chocolate-covered Craisins, they contain 180 calories and 8 grams of fat in the same size serving. In setting guidelines for sugar intake, the American Heart Association recommends that women limit their sugar intake to no more than 6 teaspoons a day, and that men limit themselves to 9 teaspoons or less. Having more sugar than this on a regular basis can increase your chances of unhealthy weight gain, Type 2 diabetes and heart problems. A 1/4-cup serving of original, blueberry, cherry or pomegranate Craisins contains 29 grams of sugar, which is more than 7 teaspoons. The same amount of chocolate-covered Craisins has 25 grams of sugar, which is slightly more than 6 teaspoons. A 1/4-cup serving of original, blueberry, cherry or pomegranate Craisins contains 3 grams of fiber. That's 12 percent of the 25 grams of fiber that women should include in their daily diet, and 8 percent of the 38 grams of fiber that men should aim for each day. Fiber is an important part of your diet because it promotes healthy digestion, and it can help lower your cholesterol levels and help reduce your risk of Type 2 diabetes, according to the Harvard School of Public Health. Craisins are a good choice because of their fiber content, but you should also consider whether the small serving size is worth the calories and the sugar you'll consume. And Craisins don't supply other essential vitamins and minerals. Consider the reduced-sugar Craisins if you would like to include more servings in your weekly diet. A 1/4 cup of the reduced-sugar version contains 100 calories and 14 grams of sugar. This is still 3.5 teaspoons of sugar, however, so if you do have Craisins, you should compensate in other areas of your diet to stay within your daily sugar limit. What Are the Benefits of Raisin Bran? How Many Calories Does an Authentic Horchata Drink Have?